Ecotourism is everywhere lately, but have you ever stopped to think about why it is important? Simply put, ecotourism is important for two reasons. It creates effective economic incentives for the conservation of both biological and cultural diversity and heritage while at the same time empowering communities to fight poverty with economic development and to work toward sustainable development locally, regionally, and nationally. The UN recognizes that ecotourism is both a market segment and a set of principles. The International Ecotourism Society (TIES) further defines ecotourism as “responsible travel to natural areas that conserves the environment and improves the well-being of local people.” This definition identifies the primary difference between nature tourism and ecotourism – ecotourism requires the participation of local people, which enables them to benefit from the proceeds. Additionally, and further expanding on the ideas set forth by the Quebec Declaration, TIES considers ecotourism to be any activity that minimizes the impact of tourism, provides a positive experience for both visitors and hosts, provides financial benefits for conservation and empowerment for local people, and raises awareness about the host countries’ political, environmental, and social climate. Tourism itself is the most significant sector of business in the world economy, responsible for over 230 million jobs and 10% of the gross domestic product (GDP) worldwide. For 83% of developing countries, tourism is the principal foreign exchange earner, and it is the top earner for 1/3 of the world’s poorest nations. With the growing momentum of the green movement, ecotourism and responsible travel may prove to be a huge income generator, especially for developing countries. Ecotourism is growing increasingly more popular and trendy, but this newfound popularity is a cause for concern for many people, from the communities intended to benefit from ecotourism to operators and even major international organizations like the UN. One of the common misconceptions about ecotourism is shared by people on both sides of the spectrum – people that assume ecotourism means “roughing” it and living out of a backpack and can’t imagine vacationing without all the amenities. Then there are the budget travelers, who have gotten the impression that the word “ecotourism” means high prices and expensive extras. Fortunately, neither camp is right – or wrong! Ecotourism doesn’t mean having to sacrifice quality or luxury. 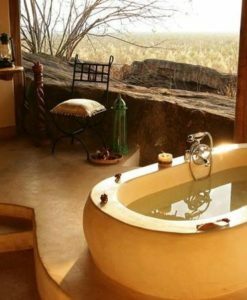 Many of the accommodations you will encounter have very high standards of quality – ecotourism lodges in developing countries can be as nice or nicer than the nicest “regular” hotels in the area – and these places remain aware of your needs while still bringing nature and culture within your reach, which is the entire point of the trip. This doesn’t mean that all ecotourism experiences have to be expensive (or even luxurious, if you prefer a more rustic experience). Accommodations and other services are available for a wide variety of budgets, especially if you are in a developing country. Some of the most inexpensive options may end up giving you the best exposure to the natural and cultural heritage of the area. Ecotourism isn’t just for backpackers, thrill-seekers, the wealthy, or the young. Families, the disabled, and people of all ages can find ecotourism vacations and experiences that fit within their interests, budget, and time. What does ecotourism mean for Africa? 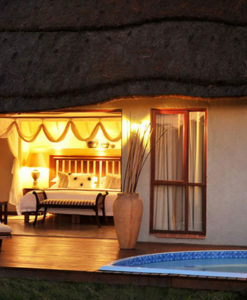 Though Africa’s development is slow, the continent is the global leader in ecotourism. The 2002 Quebec Conference convened as part of the United Nations’ “International Year of Ecotourism” (IYE). The conference aimed to increase awareness of ecotourism within the public and to promote the best practices in every aspect, from planning, regulating, developing, and monitoring ecotourism practices, all with the help of real-life experiences from around the world. Earlier in the year in Nairobi, Kenya, Africa’s ecotourism industry, from ministers to average community members, convened to discuss a direction for ecotourism on the continent. More than 100 African villages were represented – far more people attended the African conference in Nairobi than any other IYE regional conference held during the same time. Africa has been a “trailblazer” for ecotourism, which certainly has its drawbacks. The continent is learning from its mistakes, and innovative “eco-ventures” can now be found all over the continent, a testament to the enduring progress that has been made. 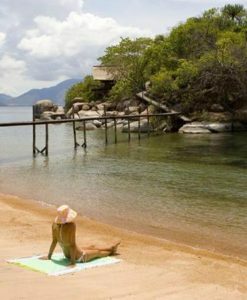 Though tourism is generally thought to be a careless industry with no regard for sensitive cultures and natural environments, ecotourism is a hope-filled endeavor for Africa. In the 1980s, many of Africa’s states were facing some social and environmental issues, like the extinction of such rare megafauna as the black rhinoceros. The fragility of Africa’s natural ecosystems started to become apparent, and many nations moved people off of their lands to build national parks and game reserves. For many people, like the Maasai tribes of Tanzania and Kenya, this move was in direct conflict with their traditional lifestyles, resulting in heightened disputes over land. Short-sighted, myopic attempts at conservation as a means to improve tourism were met with illegal poaching and hunting of the wildlife within the parks, as the people that had once lived on the land could no longer graze their animals alongside the wildlife. To uphold the conservation movement throughout Africa, something had to be done. Those that were more far-sighted recognized that local and indigenous people were not being given a stake in conservation and other tourism efforts. If they were able to participate in this process in some way and benefit from the revenue it generated, they would place a higher value on the wildlife in the parks and reserves and want to keep it alive. It was through this thought process that the African people were brought into the tourism industry. What was once a maneuver to aid conservation has now become an integral part of the African experience; so much of the enjoyment we derive from our visit has to do with the strong impressions of Africa’s people and its varying cultures that we are left with, and our tourism is no longer overwhelmingly for our benefit alone. 30% of international tourists make developing countries their destinations of choice, and long-haul travel is one of the fastest growing sectors in the tourism industry. There is so much potential for people to achieve some good during their travels, especially on ecotourism vacations. In the year 2000, British tourists spent three billion pounds (or nearly five billion USD) on travel in developing countries, which is almost comparable to the amount that the British government gave in aid in the same year. Is ecotourism the way forward for Africa’s economic development? While on the ground it seems as though the answer is a resounding yes, there is some debate over local versus Western involvement in new and existing ecotourism projects. To meet the established definitions of ecotourism, the local community must be involved in the decision-making processes involved with a project as well as benefiting financially from it. Unfortunately, it is still too early for Africa’s ecotourism industry to be fully autonomous – reliance on Western partners for financial backing and as a means to bridge the gap between a project and its intended Western market. This can be a trying partnership, and high levels of commitment and determination are needed on both sides if a project is to be a success. There is also the question of which aspects of a culture should be open to tourism. Authenticity is key for successful ecotourism, but communities can also be vulnerable to outside influences that are in conflict with their core beliefs. This issue is somewhat self-regulating, and many cultures, particularly indigenous groups, will shield their most sacred events and traditions from the public as a means of preservation. Scale is another important issue. It could be possible that ecotourism will fail because of its success – projects must remain small and monitored, lest local traditions become too diluted and natural environments become damaged. Ecotourism can only exist in a delicate balance, and it is entirely possible for new projects, even those with good intentions, to have negative consequences on communities and environments. Ecotourism can attract people to sensitive areas. Tanzania’s Hadzabe people are just one example. While exposure to tourists generated revenue for the Hadzabe, it has been too much for their traditional way of life to withstand, and the Hadzabe now face problems like alcoholism and begging, which were non-existent before overexposure to tourists. They are the victims of one of Africa’s biggest problems, which runs rampant through many aspects of day-to-day life in many places. While revenue is being generated, there is no guarantee that this money will reach the community. Furthermore, many of the smaller communities found in a country lack the resiliency of some of the more prominent groups; the Hadzabe cannot readily assimilate into mainstream Tanzanian society like many members of the Maasai tribe. The issues with the Hadzabe illustrate just one of the many reasons that it is so important for local communities to be a part of the ecotourism process every step of the way. Not only can they control their participation when things are going well, but if community leaders start to notice negative impacts of their way of life, it is vital that there are lines of communication open so that the community can voice their concerns. Tour operators and the like must also be responsible by respecting the wishes of communities that are fragile and have already been subject to or are on the verge of overexposure. Even the United Nations recognizes the potentially devastating consequences of poorly managed ecotourism endeavors. Furthermore, because of its small scale, ecotourism cannot be the sole mechanism to eliminate poverty, but it can greatly improve quality of life while at the same time supporting the conservation of natural environments if activities are well managed and proceeds reach the right people. Tourists are supportive of ecotourism endeavors as well – some polls show as many as 85% of tourists would prefer doing no damage to the environment, while 71% believe tourism should benefit local communities. “Greenwashing” isn’t a term used only in the ecotourism industry, but as ecotourism becomes more popular, greenwashing will continue to be a problem. Greenwashing occurs when a company spins their products and services, touting them as environmentally friendly when they may not be, or over-blowing pre-existing environmentally friendly practices, like using energy-efficient light bulbs in a hotel but touting every appliance as being energy-efficient. Many ecotourism operators have gotten away with greenwashing their image because there is no rating system, but many in the industry are hoping that will change. 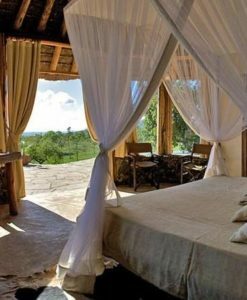 The Ecotourism Society of Kenya (ESOK) is just one organization working to develop a set of criteria to rank ecotourism facilities and operators, at least locally. The government of South Africa was also the first to launch guidelines for responsible tourism and has been a leader in that regard. Ratings will be almost a necessity to keep up Africa’s current rate of success. Until a reliable rating system is in place, it is the responsibility of the traveler to check for “greenwashing,” Get off on the right start by using a website that uses its rating system. GreenStop (www.greenstop.net) ranks accommodations and tours using its system according to ecofriendliness. Responsibletravel.com is a members-only site, where tour operators and lodging must have met the site’s strict membership guidelines. TIES, which was mentioned previously, also offers a good starting point for researching your trip to Africa. Above all, do your research, and don’t underestimate the importance of asking questions yourself to be sure that accommodations and activities will be just what you’re looking for.